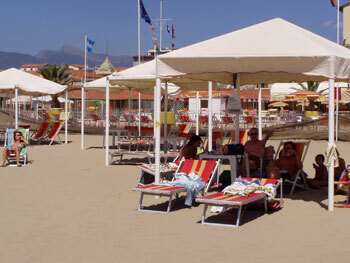 If you want to learn Italian in the sun and by the sea, then Viareggio in northern Tuscany is an excellent choice. 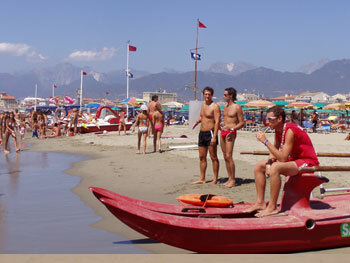 The long sandy beaches, restaurants offering seafood specialities and fine wines, together with the vibrant bars and discos make Viareggio a fun and popular place to learn Italian. 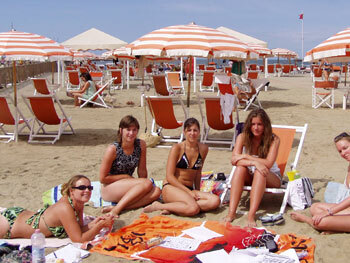 In Viareggio it is easy to get to know the locals and to practice the Italian you learn on your course. The town is just a short journey from Pisa, Florence and Siena, so a great place from which to discover Tuscany, whilst you learn Italian! For music lovers, the famous open-air Puccini Festival takes place by the picturesque Lake of Massaciuccoli in Viareggio in the summertime and every August the Festival Gaber is also hosted here and attended by many high-profile Italian musicians. For sport enthusiasts there are many opportunities in and around the town for windsurfing, beach volley and for tennis. For food & wine lovers then this town has abundant small cafes and restaurants offering excellent food and all the fish markets have beautiful, fresh products, as well as meats and cheese! 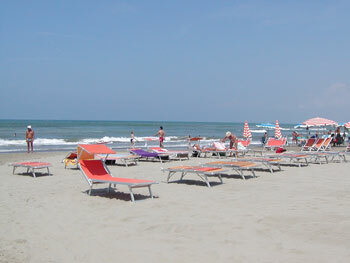 Our language school in Viareggio, located in the town centre, is just a short walk from the beach. The school is only open for 3 months in the summertime. Students with some prior knowledge of Italian can begin their course on any Monday, from the end of June until the beginning of September. For complete beginners of Italian there are special start dates within this 12 week period. Please contact us for further details. There are 18 fully equipped classrooms, as well as a library, a computer room with free internet access for all students and a study room. You can learn Italian with either an Intensive, or a Super-Intensive course, consisting of either 20 or 30 lessons per week. The group classes are often small, with an average of just 6 or 7 students per class and a maximum of 12. During the mornings the first 2 classes focus on grammar and language structure and the next 2 classes have a greater focus on communication and writing skills. If you opt for the Super-Intensive course then you will have an additional 2 classes in the afternoons with greater use of group conversations, dialogues and discussions to further your knowledge. 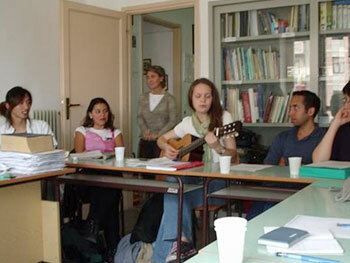 All of the teachers at the school are native Italians with qualifications in teaching Italian to foreigners. All kinds of materials and learning methods are incorporated into the classes, enabling the development of both grammar and communication skills, as well as all other aspects of the language. The teachers adopt methods appropriate to each class and a personalised programme is created to meet the needs of the individuals in each group. If you would like to book any additional private language lessons or a course of private Italian lessons only, then this will be no problem. Please contact us with your exact requirements. There are additional and exciting course options available at this school for students who are interested in learning about Italian Art History, Italian Cooking or Italian Wine Tasting! These classes are available in combination with an Intensive language course. Language & Italian Cooking: The basic elements of preparing pasta, stews and pizza, as well as some typical regional dishes such as pasta alla norma from Sicily, or saffron rice from Lombardy are taught in 2 afternoon/evening sessions of around 3 hours each. The course takes place in a typical Italian home and finishes off with a dinner, to test your cooking skills with wine and with the chance to socialise in Italian! Language and Italian Art History: This is a 2-week course with 4 Art History classes each week, in addition to the Intensive general Italian course. Students need to have an elementary level of Italian to attend this programme. The main focus in this course is on the history of medieval and renaissance art, with attention to painting in the Middle Ages and in the Renaissance period. There are many themes, including the specific development of Italian artistic traditions during these two periods. Language and Wine tasting: This is a 1-week course consisting of 2 lessons of approximately 2 hours each, in addition to your Intensive general Italian course. It is a very practical course teaching the main concepts related to Tuscan and Italian wines as well as discovering these wines as part of a meal, in combination with traditional Italian food! Our school in Viareggio can arrange accommodation for you in a self-catering, shared student apartment, with shared kitchen and bathroom, or alternatively, you can choose to stay with a carefully selected Italian host family, where breakfast is included. Students who stay with host families tend to learn Italian more quickly, as they are able to practice more often. As with all our Italian language schools, our school in Viareggio offers a programme of activities, to help students practice their Italian outside the classroom. The prices are always reasonable and include guide, transportation, entrance fees to monuments or any tastings. There are activities such as: class dinners, wine tastings, Italian film evenings and excursions to Pisa, Rome, Siena and Florence, for example. The full programme and details of the cost of entrance fees or transport will be provided on your arrival at the school, on the first day of your course. The best airport to fly to is Pisa, just 20 minutes from Viareggio. 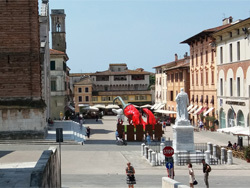 Our school in Viareggio can arrange airport transfers for students from Pisa Airport, if you would like to be met on arrival and taken to your accommodation in Viareggio. My course, I had a great teacher. We only two people in my course, but that was really good for my italian. I was able to go on a tour with some studens from Pisa one time during my two week stay in Viareggio. A day at the Viareggio Carnival!